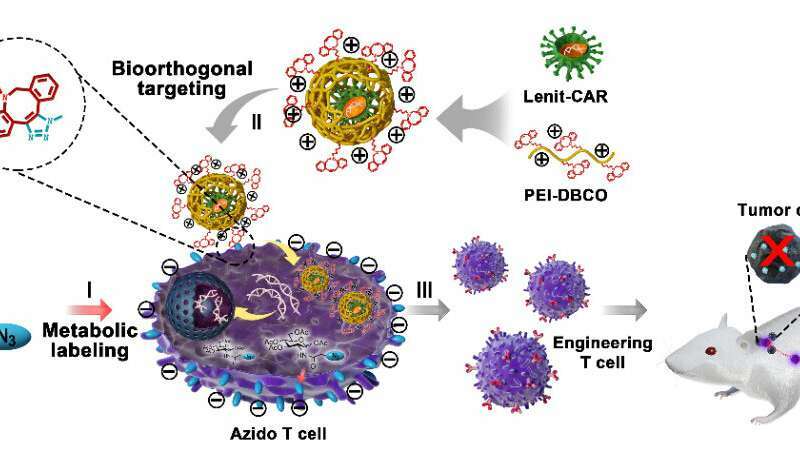 A research team led by Prof. Cai Lintao at the Shenzhen Institutes of Advanced Technology (SIAT) of the Chinese Academy of Sciences and other collaborators developed a "safe, efficient and universal" technique based on bioorthogonal chemistry and glycol-metabolic labeling for viral-mediated engineered T cell manufacturing. Their findings were published in Advanced Functional Materials. "We found that this artificial chemical receptor effectively facilitated viral binding to T cells and elevated the transduction efficiency of the lentivirus from 20 percent to 80 percent without any effect on T cell proliferation and activity," said Cai. "This artificial chemical modification was also appropriate for introducing other heterologous genes into T cells, including GPF, CAR and TCR, indicating a great potency for universal T cell engineering."